Today is a very special day. We got to take part in harvesting the rice. 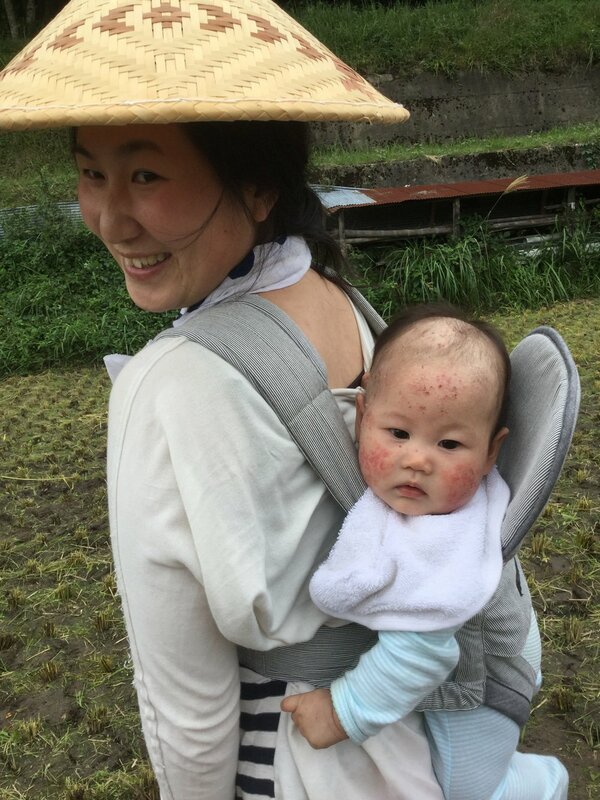 The Uji family have two fields which yield enough rice for the entire family (8 people). The rice was planted in May, and harvest is now in September. The rice was cut yesterday and today we put it out to dry. Rice used to be used as money. In the Edo period workers got paid in rice! When Mrs. Uji went to elementary school the fees could be paid either in money or in rice! She bought her schoolbooks with rice. Mrs. Uji tells us that calves and timber were also used as currency. The general rule of thumb here is that one person uses about 60 kg of rice a year. That would mean 180 kg of rice for our little family! Wow. We gathered the rice bunches and placed them on the bamboo rods to dry. The rice dries for 10-14 days and then the grains are separated from the stems. The stems are then used for crafts and decorations. The stems can also used for bedding in cowsheds much like straw. Hanging the rice to dry! The rice is packed tight onto the bamboo rods. We are expecting a typhoon next week so we needed to pack it special tight so that it won't fly away! Mr. Uji was very proud of his bamboo joinery - it is very stable. In about two hours we were all done and ready for a lunch break. To finish, bunches of rice are spread on top of the rows to provide a cover from rain. 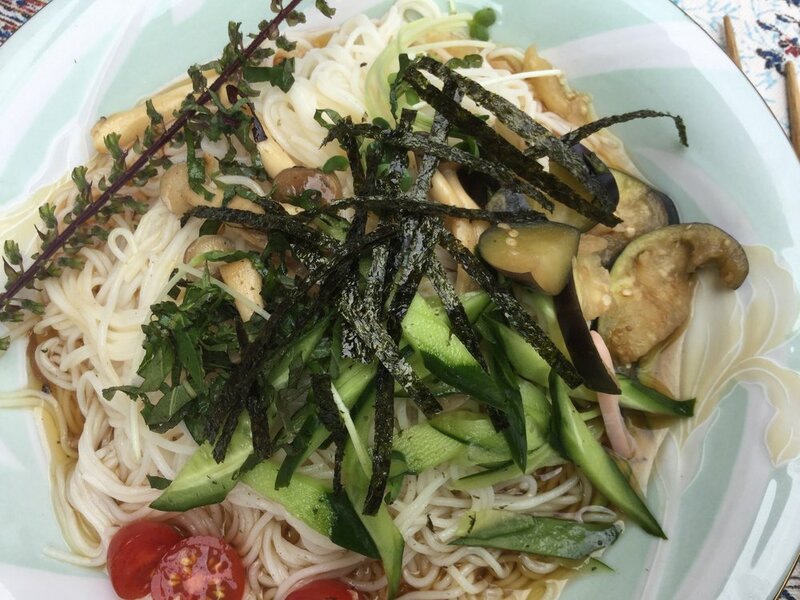 And home to a great Somen Noodle lunch! It is important to note that the Uji family only engage in organic farming, and harvest their rice the traditional, manual way. This is not at all the standard in Japan, where rice generally is very heavily sprayed and combine harvesters directly bag the grains in the field without any slow drying. We are so grateful to be here, able to appreciate all the traditional skills and values that are being shared with us.